If you’re currently experiencing headaches, fatigue or high blood pressure, poor air quality could be to blame with particles and poor ventilation being the hidden culprits. Children are the most vulnerable to poor indoor air and can experience lowered immunity, difficulty concentrating and childhood-onset asthma. After all, we take 20,000 breaths a day. What are you breathing in? Allergens? Chemicals? VOC’s? Gases? Odors? Most likely it’s all of the above. Today, 26 million Americans, including 6 million children, live with asthma. Each year about 6.5 million deaths worldwide are linked to air pollution, as reported by the International Energy Agency. The importance of creating fresh, clean and purified air in your home and work environments cannot be stressed enough. 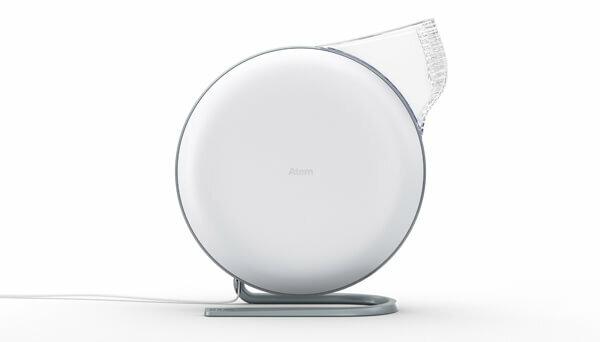 If you aren’t currently using a whole house or portable air purifier, then keep on reading. Breathing clean air is no longer a luxury, it’s a necessity for our overall health and well being. In fact, according to the World Health Organization, 92 percent of the world’s population breathes polluted air. The he Environmental Protection Agency (EPA) classifies indoor air as one of the top five health risks Americans face, yet, most people are still spending a whopping 90 percent of their time indoors with no safety net in place, whatsoever (you?). A study conducted by MIT’s Laboratory for Aviation and the Environment found 10% of deaths in America are attributed to air pollution. Toxic exposures definitely increase our risk for many diseases, including cancer. Indoor air, on average, is two to five -and up to 100 times – more polluted than the outdoor air, according to the EPA. With the toxic body burden most people are carrying around today, combined with air pollution, having a remediation plan in place is essential. While we can’t control environmental pollution and other toxic exposures outside, we can control our own home’s air. Oh, did I mention we have just the solution(s)? Meet IQAir. Good news! We’re offering you TWO CHANCES to win top of the line solutions in air purification and air quality monitoring for your home from our friends at IQAir. Winners Will Receive: 1st Prize: A handmade Klaus Room Air Purifier (ARV $2,500); 2nd Prize: A bundle of Atem Desk and AirVisual (ARV $668). YES, that’s a total value of $3,168.00! Click below to enter (and share with a friend or loved one who could benefit from breathing clean, fresh and purified air). Sweepstakes open to residents of the United States. Ends 12/11/18. Did You Know? In 1963, the founders of IQAir introduced the world’s first residential air filter based on HEPA, or high-efficiency particulate arrestance technology. This innovation helped reduce indoor pollution as well as chronic asthma symptoms. Soon HEPA filters became so widespread that the U.S. Department of Energy (DOE) required that all filters sold under the name “HEPA” must filter at least 99.97% of airborne particles down to 0.3 microns. However, most HEPA air purifiers are not tested for total efficiency and many can be 80 percent, or less, effective than stated due to leakage. IQAir’s patented HyperHEPA® filter goes further. HyperHEPA filters remove 99.5% of particles down to 0.003 microns, which are 10,000% smaller than the DOE’s required 0.3-micron particle size. Unlike particles, the molecules that comprise gases, odors, and volatile organic compounds (VOCs) are not solid and will float through even the densest HyperHEPA filters. That’s why the HealthPro Plus features a patented V-5 Cell gas and odor filter to eliminate harmful chemicals and compounds with five pounds of activated carbon. The AirVisual Pro is a popular air quality monitor that is a part of the largest air quality monitoring network in the world. It now has IFTTT (if this then that) functionality. IFTTT allows your gadgets, apps and devices to talk to each other – in this case, IFTTT makes the air quality data, including temperature, humidity, CO2, and AQI, from your AirVisual Pro actionable. With LED lighting and a rechargeable battery, this monitor can check both indoor and outdoor pollution to measure particulate matter, carbon dioxide, humidity and temperature. The made-to-order Klaus series features a pistachio burl finish and retails for $2,500. 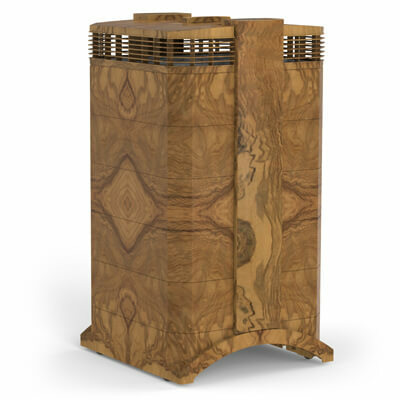 Inside the Klaus Series is the technology of IQAir’s award winning, #1 rated HealthPro® Plus air purifier, housed in a handcrafted and luxurious wood cabinet, carefully constructed by renowned master artisan Jim Ipekjian. Good news! We’re offering you TWO CHANCES to win top of the line solutions in air purification and air quality monitoring for your home from our friends at IQAir. Winners Will Receive: 1st Prize: A handmade Klaus Room Air Purifier (ARV $2,500); 2nd Prize: A bundle of Atem Desk and AirVisual (ARV $668). YES, that’s a total value of $3,168.00! 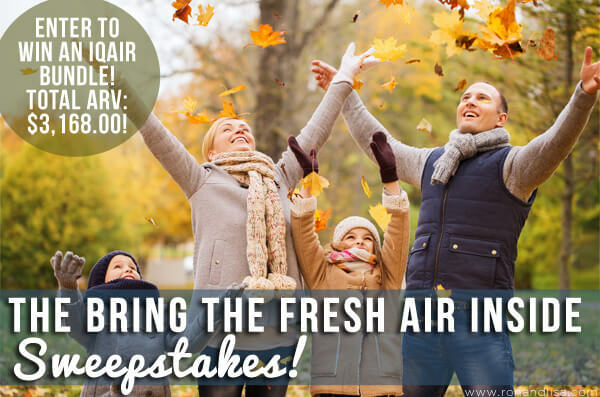 Click below to enter (and share with a friend or loved one who could benefit from breathing clean, fresh and purified air. Sweepstakes open to residents of the United States. Ends 12/11/18. 2.) Ozone Generators – These do little to clean the air and can be extremely harmful to your health. Even the California Air Resources Board, a government agency, has taken measures to warn people about the harm ozone generators can cause. Indoor ozone levels can rise five to ten times above recommended limits; even a “safe” ozone generator that emits a small amount of ozone can quickly trigger potentially life-threatening ailments like asthma attacks. Plus, ozone reactions can introduce ultrafine particles (UFPs) into the air. UFPs can get into your lungs and your bloodstream, causing heart disease and even stunting lung development in children. 3.) UV Light Purifiers – Many UV light purifiers produce ozone. Furthermore, air treated with UV light does nothing for pollutant particles; the air can still be full of harmful particulate matter. Plus, some bacteria can come back to life after being disinfected. While UV light somewhat disinfects, it doesn’t purify air, and research shows that UV’s disinfection potential for air may be exaggerated. Oh, so sorry to hear Vickie! Happy to hear you have moved out of that apartment and are in a better place. Wishing you much luck in this sweepstakes! We couldn’t agree more Nancy! It is truly a gift of health. Appreciate all of the clean purified air one can get. Indeed! Good air is essential to a healthy life and something we ALL deserve. I wish we could give air purifiers to everyone, but happy for those of you who are here educating yourself and understand the value of good indoor air quality. I have tried to enter the purifier giveaways you have emailed me to enter and its not registering as entered. Can you please confirm that my entry has been received?. Thank you for this chance to win because my home was flooded during Hurricane Harvey and again the 16th of last month so we are fighting mold and bacteria from river water meaning we are having to start all over with walls and floors and everything else we did a year ago. This would be a true blessing. Entered and shared with hopes of winning. Oh no! That’s unfortunate Sherry. We hope you are using something in the meantime to purify your air during the clean-up! We have a lot of great info on our site that you will find useful in dealing with mold. Just type ‘mold’ in the search box. Sending you positive vibes for this sweepstakes – sounds like you could really benefit! What With All The Smoky Air From The Wildfires Up North, And Down South Inundating Us With Smoke in Northern California For A Week And 1/2 Bothering My Asthma And Making Me Home-Caged, I Could Use One Of These!! Ughh Karen, we hear you as Southern California residents ourselves! It’s so devastating to see the fires and hear of people (and animals) losing their homes. There certainly many people affected that would greatly benefit from the IQAir purifiers and monitor!! We are sending prayers and healing energy to you and all affected!! Where do you find your winners list?